In this blog, we'll explain what you need to know about solidThinking’s Click2Cast software and how this software can enhance manufacturing and digital design. Click2Cast is a casting simulation software developed around the concept of EASYmulation. Due to the simple and quick mold filling simulation, this software allows user to enhance and optimize their manufactured components while avoiding typical casting defects such as air entrapment, porosity and cold shots. 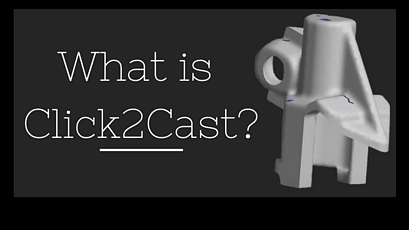 For example, this video shows how Click2Cast can simplify one of the biggest concerns in manufacturability. How can Click2Cast benefit you? Click2Cast encourages users to be innovative and revolutionary in a stress-free, 5-step process. The ability to set units of parts, create a mesh and define factors like materials, temperatures and gravity enables users to calculate and simulate the cast filling process and the solidification process alike. Being simple and intuitive, Click2Cast creates virtual prototype molds that allow the user to test out the prototypes on their desktop without having to recreate a new mold. As a result, users can troubleshoot and experiment with alternative methods in a matter of minutes, saving time and money. With Click2Cast, you can test molds without investing extra time, labor or capital, and as a result, it can make your business more efficient. For more information on other leading simulation software, click the link below.